Decision: Should you play Volley Caller? Should you buy new horseshoes for the slowest horse on the racetrack? Well, if you have to ride that horse, you probably should. For an extremely bad horse, these shoes aren't bad at all. Lets get this out of the way first - Grot Bow is a bad attack. It's not the worst attack in the game (thanks Hungering Skaven! ), but it's close. An unmodified 2 sword attack misses almost half the time, and this one only does 1 damage when it hits. 3 range is good, but these attacks are manifestly worse than the Boltstorm Pistol attacks of the Farstriders. An average unblocked use will only net you 0.55 damage. That said, if you're going to play Gitz, you don't get any choice in who you bring along with you, so Dibbz, Stikkit, and Redkap are going to be on the board - and the only thing they brought to the party are these very bad bows. So is playing a card that's limited to this attack even worth it? Volley Caller definitely improves Dibbz and his friends' output significantly, if you can meet it's positioning requirement. Adding on the 2nd attack to the mix means that your unblocked activation (viewed as a single attack) will have an average damage output of 1.11. This output is essentially identical to a 2 sword 2 damage attack. Not bad, Gitz. That said, replacing the attack entirely with a weapon may be a better option. Currently, however, none of the range 3 weapon attacks grant a better return than Volley Caller. If you want to go melee, there are certainly options, though! Stikkit and his friends aren't top teir models. They are extremely fragile at 2 wounds each, have only a single weak attack, and aren't particularly mobile or defensive on their front sides. 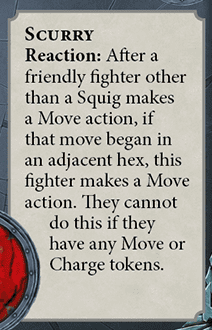 Being inspired doesn't help much either, as they pick up only a single dodge die and a 4th hex of movement. 1) When one of your archers (let's say Dibbz, because his name is the shortest) has Volley Caller, he can essentially create a double Charge action, but only Dibbz gains a charge token. Choose Dibbz to Charge, and scurry his neighbor. Then attack with Dibbz and Volley Caller his neighbor. Other than the obvious benefits to this strategy, it also fulfills three quarters of the requirements to score Keep Them Guessing in just one action. 2) Using the same setup, this time we Charge the other goblin, and scurry Dibbz along. This doesn't allow us to use Volley Caller's action this turn, so we'll only get one attack and the other goblin will get a charge token. However, on your next activation you can Attack with Dibbz and use Volley Caller to have his neighbor attack too, despite having a charge token. This can potentially net you 3 extra attacks in a turn, enabling such objectives as Concerted Attack and Finish Them. One bonus of equipping Volley Caller is that it reduces the work required to achieve several common objectives - and some lesser used ones as well. Of course, upping your average damage per activation is going to help you achieve a number of generic objectives and score more glory from kills, but we'll be focusing here on objectives that gain a distinct advantage from being played with Volley Caller. Of the Gitz-specific objectives, only Vicious Killers gets a boost, effectively cutting the possible number of activations required to score it in half. Remember also that the model you kill for this objective doesn't have to die by Grot Bow. You can use Volley Caller actions to soften up an enemy fighter for death by a stronger attack. In the general objective category, the most obvious benefit falls to Concerted Attack - a single activation with Volley Caller gets you 2/3 of the way to scoring it, and you don't have to worry about missing the attacks. In many situations, you'll get the same benefit when attempting to score Multiple Fronts/Grand Melee - though you will have to connect with your tiny goblin arrows. Precise Use of Force also gets a boost from Volley Caller. As with Vicious Killer, using Caller to score Precise increases the wound range of models you can effectively target. Additionally, Volley Caller allows you extra precision when attempting to finish off a model with only one wound left, upgrading your raw accuracy on the activation by nearly 25%. A Volley Caller-upgraded pair of Gitz gain a similar benefit when trying to score either one of Precise's ugly little sisters - The Bigger they Are and Finish Them, either of which could reasonably find their way into a Gitz deck. It should be noted that equipping Volley Caller also moves you toward achieving objectives like Escalation and Master of War, but these objectives can be achieved by equipping any upgrade, so Volley Caller doesn't give you any special benefit in this case. Damage bonuses to range 3+ attacks are hard to come by. One option that was recently added to the game to bump ranged damage is Fighter's Ferocity. Would you be better off upgrading your Gitz archer with Ferocity than Volley Caller? In terms of raw accuracy and damage output, Fighter's Ferocity is strictly worse than Volley Caller, as long as you can keep two archers standing next to each other. 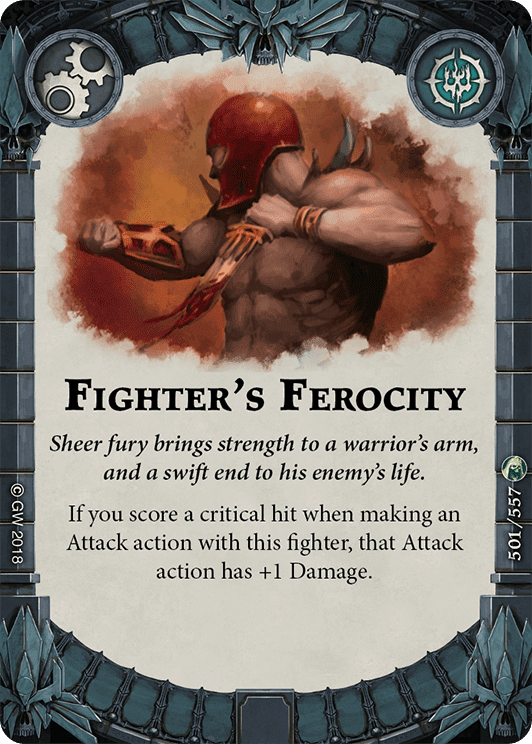 Fighter's Ferocity will actually hit for 2 points of damage at a slightly lower rate than a Volley Caller activation will hit with both attacks. Additionally, Fighter's Ferocity doesn't contribute any to raw accuracy. 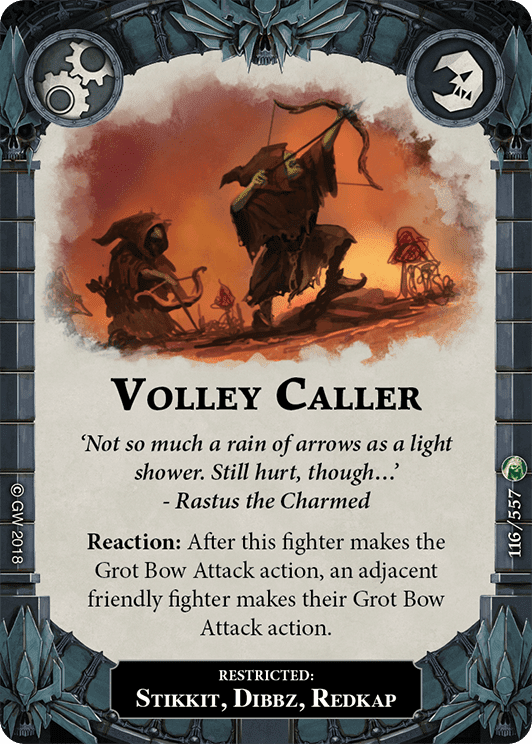 In the end, a Ferocity activation does an average of 0.86 damage per unblocked use - a significant improvement over an non-upgraded Grot Bow (0.55) but much worse than a Volley Caller's average unblocked activation of 1.11. Fighter's Ferocity also doesn't make many of the objectives mentioned in the section above any easier to score. In fact, it actually makes Precise Use of Force, The Bigger They Are, and Finish Them harder to score! On the upside - and this is a big consideration - Fighter's Ferocity doesn't have to go on one of our three archer triplets. Zarbag could equip it to become a cleaving machine, or throw it on a 3 hammer squig to pile on the extra damage from crits. With nine possible targets instead of three, Fighter's Ferocity is also far less likely to sit in your hand doing nothing or lie dead on the board (as Volley Caller will do if two of the three Git archers find their way up to the Big Stink in the sky). Dibbz, Stikkit, and Redkap are bad models. Grot Bow is a bad attack. If given the choice, no competitive player would draft them into their army. If you want to play Gitz, though, you aren't given a choice. It's not really fair to compare Volley Caller to cards like Incredible Strength (which the Git archers can't use anyway); of course Incredible Strength is better than Caller. Even in Gitz, we'll probably play Strength over Caller, since six of our nine models benefit from Strength. So the real question here is: are the three Gitz archers worth using upgrades on? That's not an answer we can easily provide here. Your choice of gambits, the upgrades you choose, your objectives, and even how much you love that stupid hat with the arrow through it all may influence your answer to that question. Given the usefulness of a range 3 attack in a control/aggro hybrid like Gitz favors, it may be worth it. In exchange for a card slot and a single glory, you increase your access to several objectives and vastly improve the versatility of one of your worst models. 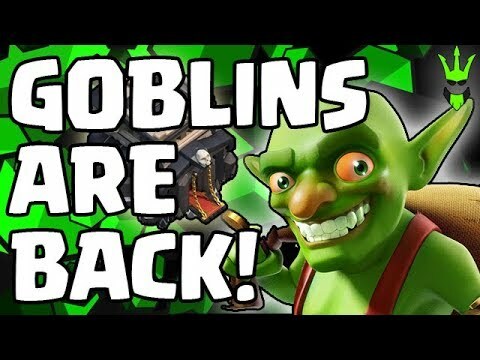 If you do decide you want the three dumb goblin cousins to be a bit less worthless, it's the best offensive option currently available to them in the game for a non-magical range 3 attack. It also makes several objectives significantly easier to score, and objectives are how we win the game. It outperforms Fighter's Ferocity in every way but one: potential targets (which is, admittedly, a big deal). Great trick for our lovely gitz. What should be the gitz playstyle? Defensive?